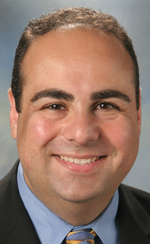 Troy Chamber President/CEO, Ara Topouzian, was recently awarded the Mike Conboy Professional Development Award for outstanding contribution to Michigan Economic Developers Association. The award is given to MEDA members who have made substantial, long-term contributions/commitment to MEDA, specifically focusing on the advancement of the economic development profession through support of education/training and/or by expanding the knowledge base of economic developers. Thelen added that Ara is active with the regional efforts and is quick to mentor new people entering the profession. His positive, disarming demeanor has made him a superior educator the field of economic development. The MEDA Board of Directors is responsible for selecting each annual honoree. Since the award was created and presented to Mike Conboy in 1989, 22 recipients have been honored.